The University folk are off playing at the Bloomsbury Theatre again this month (get tickets for that here: http://www.thebloomsbury.com/event/run/1683), so at the Wilmington Arms we get a chance to explore the world of journalism instead. 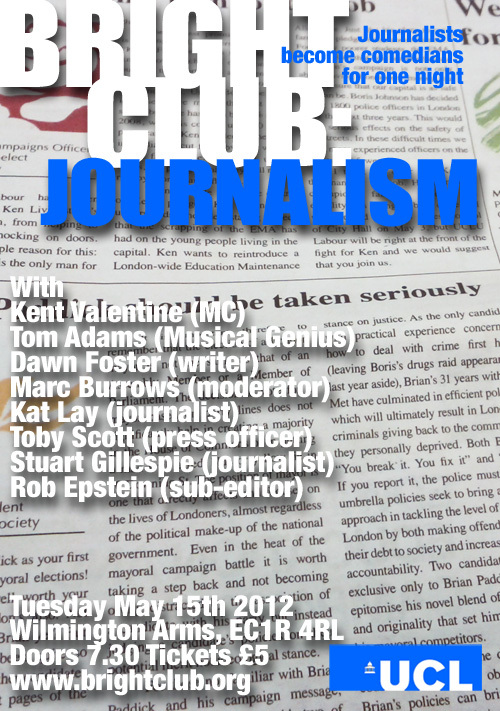 Your MC tonight is Kent Valentine, comedian, Bright Club veteran and occasional computer games journalist (http://www.kentvalentine.com) and he’ll be joined by musical act Tom Adams (http://www.tom-adams.co.uk) who is properly rock and Roll (if by “Rock” you mean “tea” and by “Roll” you mean “biscuits”). Marc Burrows, who tries to stop the Guardian website descending into Nazi slurs, sexist rants and sectarianism. Dawn Foster, who writes for the Guardian about cycling, Wales and cycling in Wales. Kat Lay, who creates amazing features for tabloids as chaos breaks out around her. Rob Epstein, who keeps it clean subbing for the Independent on Sunday. Stu Gillespie, who breaks all the big stories for the Fife Herald. Toby Scott is indisposed so super press officer Jay Stone is stepping in with her work on-call mobile in her pocket. Bright Club Edinburgh is officially the most “in Edinburgh” of all the Bright Clubs. We have a regular home at the famous Stand comedy club and do the occasional special show to fit in with cool things happening in the city – such as the Edinburgh Fringe (you may have heard of it). This month we’re going to give a helping hand to our good friends the evil geniuses, super villains and criminal masterminds of the world, with some hints and tips from genius researchers. Mags Pullen, plant scientist and triffid fan. 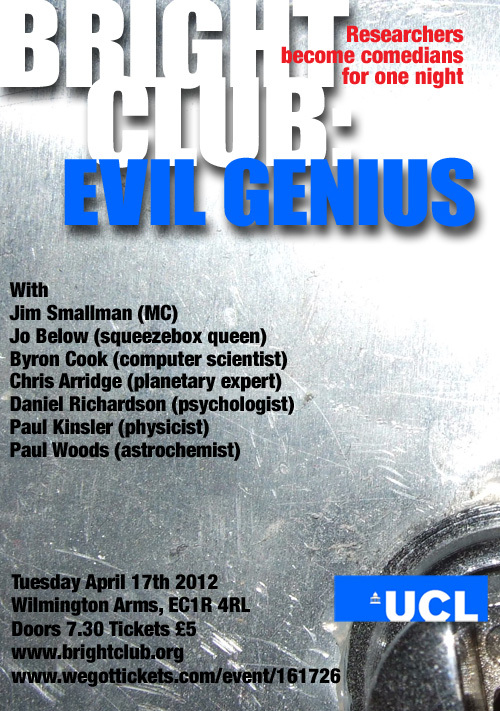 Doors open at 7.30pm on Tuesday 17th April at the Wilmington Arms, 69, Rosebery Ave, London, EC1R 4RL.